The Talking Box: Giveaway: Hunger Games Poster! It's been a while since we gave away a poster. And a while since we talked about movies. But, today we're giving away a poster for Hunger Games! If you're wondering about the connection to television, remember that many of the folks in the cast have backgrounds on the small screen - Jennifer Lawrence on The Bill Engvall Show, Liam Hemsworth on Australian shows The Elephant Princess and Neighbours, Elizabeth Banks on 30 Rock and Scrubs, and Woody Harrelson on Cheers. The poster promotes the film, which Suzanne Collins adapted from her 2008 novel of the same name. The movie is scheduled for release in the US on March 23rd, so we're only a couple of weeks away! 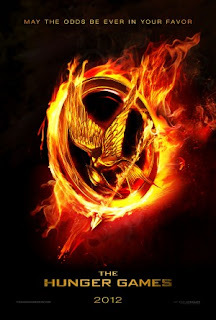 Hunger Games is the first in a trilogy of books, so let's hope that the movie is successful, as Lionsgate is already planning on the second novel, Catching Fire, being ready for release on November 22nd, 2013. How to Enter: You must leave a comment related to the books or the film - talk about your favorite scene, the characters, what you're looking forward to seeing in the movie, or some other aspect of Hunger Games. After you leave a comment (which is worth ONE entry), you can try for EXTRA entries into this giveaway - following TheTalkingBox on Twitter and liking us on Facebook can earn you one additional entry each, PLUS, you can tweet out about the giveaway for another entry... so there's FOUR total possible chances for you to win! If you already follow/like us, awesome. The Rafflecopter widget below has an option for that. If you're not into social media, no worries, you still get one entry with your comment below! Just be sure to "log in" with the email option - otherwise we'll have no way to contact you if you win! Note: you do need to reside in the US in order to win this one. This giveaway will run about a week - no entries will be accepted after 12:01am ET on Monday, March 12th, 2012. A winner will be chosen via random number generator through Rafflecopter later that day. Thanks for entering, and let us know if you have any questions! Let me first say there's a SPOILER a bit later. Now that that's out of the way, let's get to it. I'm really looking forward to seeing The Hunger Games. I devoured the book series within a week because it's the kind of story you can't put down. I did find the writing to be a bit too simple for my tastes, but I can certainly understand why; it's a book geared for teens. One of my concerns with the movie adaptation of the book series is the fact that they have four movies planned for three pretty short books. Historically, movie series that do this sort of move (Twilight, Harry Potter, etc.) tend to split the final novel in half. With Mockingjay still fresh in my mind, I can see approximately where it could be split. A good spot would be just after (remember the spoiler alert?) the epic escape from the quarter quell. But with that split, there's not a whole lot of story from which to create two feature films. But even with these concerns, I'm really excited that I'll get to see The Hunger Games trilogy in movie form. The trailers look fantastic with every snippet easily recognizable from the book and I was thrilled to hear Rue's song in every trailer. I'm hoping that the popularity of The Hunger Games can draw some attention to the real world issues that it explores. I am certainly not the first to say this, but it cannot be said enough. Class division, dictators, hunger, and many other issues raised in these books are not fiction. Hopefully, the fans of the book and movie can mobilize to make a real difference in our world and make it a better place for future generations. Katniss says "Frankly, OUR ANCESTORS don't seem much to brag about. I mean, look at the state they left us in, with the wars, the broken planet. Clearly, they didn't care about what would happen to the people who came after them." I love THG...it is by far my favorite book ever. The first book is amazing,and even though I haven't even finished the second book yet,I am completely obsesseddddd with these books! The movie is going to be pure flawlessness,I think the actors chosen really well fit their role. There are so many scenes I can't wait to see-the cave scene,the fire costumes,the arena itself... counting the hours!!! My favorite scene is the one with Katniss and Rue and the flowers and the song. I can't wait to see how it looks in the movie. The part that I love the most about the hunger games trilogy is the undying love that Peeta has for Katniss. Even from the age of 5 he has always had feelings for her, and even when she seems to be trying to kill him at the beginning of the hunger games he still does not stop trying to protect her. I love that too, how he feels that her life is more important than his, and that he would do anything to protect her. He also didn't stop loving her even when he thought she was in love with Gale. It's just such a heart warming backstory that provides such a great addition (and doesn't overpower) the main story which is their fight to survive. Im so stoked to seethe arena and all the visual effect and what not, especially the tracker jackers and the mutt dog things! I am really looking forward to when Katniss nurses peter back to health. That was a large portion of the book. And the scene with the berries. I also can't wait to see if I visualized the arena like it is! I'm really excited to see all of the fighting, especially the cornucopia scene at the beginning of the games, the fighting when the remaining tributes are trying to collect the bags that contain one thing that each tribute needs (where thresh lets katniss go), and the final muttation scene. Ever since reading that part I've been really interested to find out what the muttations are going to look like, especially how human they are going to make them (or not).